Rivka Rocchio is a community cultural development theatre-maker interested in the arts as a means of cross-cultural communication. She received her M.F.A in Theatre for Youth from Arizona State University and her B.A. in Theatre Education and Writing, Literature and Publishing from Emerson College. Rocchio has taught Theatre and English in prisons, high schools, and middle schools and worked with the Peace Corps in Samoa and Liberia. As an Assistant Professor in the Theatre and Dance Department at SUNY Potsdam, Rocchio teaches Theatre and Community, Devising Theatre, Applied Theatre, Directing, Acting/Scene Study, Pivotal Playwrights, and Play Interpretation and Analysis. Rocchio organized SUNY Potsdam's inaugural Playwriting Across Prison Walls Play Festival, November 2018. Click here to view a recording of the 2018 project. 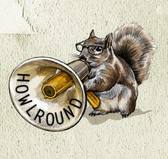 Rocchio is directing Caryl Churchill's Love and Information this fall at SUNY Potsdam. Press from the Watertown Times on the Festival. Click here to watch the festival. Rivka is now a 200 hour certified Kripalu Vinyasa Yoga Teacher after completing the summer program at the Kripalu School of Yoga. Click here for a Press Release from NY DOCCS on the drama group at Riverview Correctional Facility. Click for free access to "Theatre Across Prison Walls: Using Democratizing Theatre Methodologies to Subvert Carceral Control"
Click here to read Rocchio's "Poetry Slammin' in the Slammer: Questioning the Limits of Arts-in-Corrections"
Click here to read about the Applied Theatre course partnering inmates at St. Lawrence Correctional Facility and SUNY Potsdam students. In April 2017, Rocchio organized and advised SUNY Potsdam's One Act Play Festival focused on women playwrights and issues of social and racial justice. This summer, Rocchio is teaching Devised Theatre inside Ogdensburg Correctional Facility in upstate New York. The class will be a new offering for the men currently incarcerated, and the first time theatre will be offered as a course. Click here to read Rivka's latest article on pedagogy and activism in Introduction to Acting coursework. 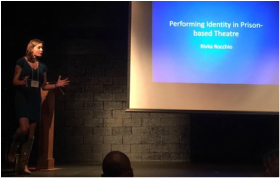 ​On September 23rd, Rocchio presented in NYC at the 2016 Performing the World conference around ideas of power, gender, and prison-based theatre. 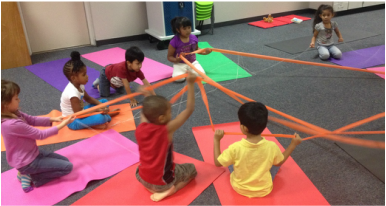 Read the latest missive on creative drama and yoga with kindergartners! It is featured on the TYA/USA blog. 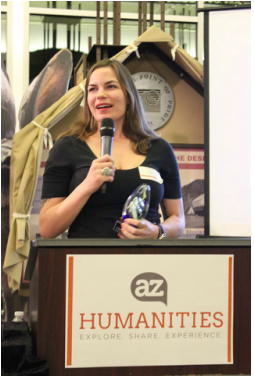 PHOENIX, AZ – Arizona Humanities is delighted to announce the recipients of the 2015 Humanities Awards. The public attended the awards celebration on Friday, November 13, 2015 from 4:30 – 7:00 p.m. at the picturesque North Mountain Visitor Center, 12950 N. 7th St. Phoenix, AZ 85022. Marshall Shore, Arizona’s Hip Historian was the emcee and host for the evening. The program included a presentation by the Veterans Heritage Project, entertainment by spoken word artist Truth B. Told, and music with famed local jazz pianist Charles Lewis and his trio. Guests enjoyed appetizers and beverages, and the opportunity to bid on wonderful silent auction gifts for the holidays. 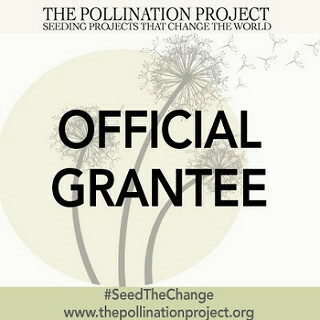 ​Excited to announce that Theatre Across Prison Walls just received a $1000 seed grant from The Pollination Project. Check out their grant making program and read more about our award HERE! October 3rd -- Rivka was awarded Education Volunteer of the Year award from Arizona Department of Corrections ASPC-Eyman in appreciation of her commitment and dedication. 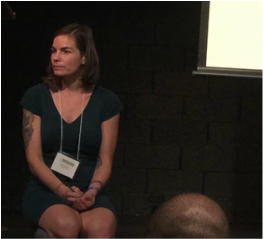 Rivka teaches weekly drama courses on Cook Unit at Eyman State Prison and is working on a new theatre project called Theatre Across Prison Walls. The project is a collaborative partnership between inmates and students at Arizona State University and will culminate in a performance inside Eyman Prison on November 24. ​Rivka has been named a 2015/16 Spirit of Service Scholar! 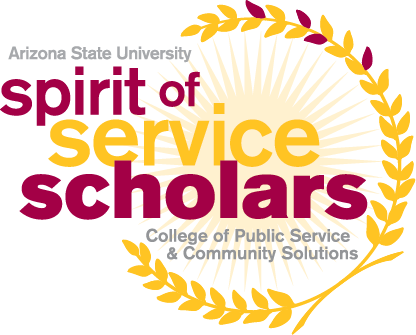 The Spirit of Service Scholars initiative honors outstanding students interested in pursuing careers in the public and non-profit sector. Scholars receive a scholarship, and mentorship from high-profile practitioners and leaders, and education on core topics for public service through seven Saturday seminars. This initiative seeks to help create the next generation of public service leaders who will transform the non-profit and government sectors at all levels. ​Check out the latest digital storytelling project Rivka completed as the resident artist at Tumbleweed Center for Youth Development. The video is an ethnographic look at the spectrum of services Tumbleweed offers to homeless youth (between the ages of 12-25) in Maricopa County, AZ. 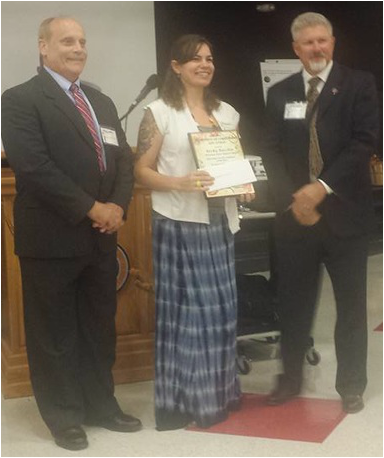 Rivka Rocchio was awarded the Arjit Guha Student Advocacy Award for her work in ﻿arts-in-corrections﻿. The award ceremony took place at the Arizona State University Art Museum. Read Rivka's latest article on TYA/USA's blog on how to use theatre in cross cultural situations. Rivka is now a certified kids' yoga teacher after completing Rainbow Kids' Yoga teaching certification training. Rivka Rocchio named 2015 MLK Student Servant Leader by Arizona State University. Here's a video of the event. Check out Rocchio's speech here.